Funerals, rock and roll, embalming fluid murders and Daleks, Daleks, Daleks -- it must be classic Sixth Doctor story Revelation of the Daleks! Because we included so much extra stuff about Evelyn Waugh's The Loved One in this episode, we didn't get all the way through Jesse's production notes, so watch out for an upcoming blog post from Jesse with some production-related bonus content! As always, click here to find images, videos and further reading on our blog. You can also like us on Facebook or follow us on Twitter! The plague, the Great Fire of London, space fish and their disco robot -- it must be classic Fifth Doctor story The Visitation! 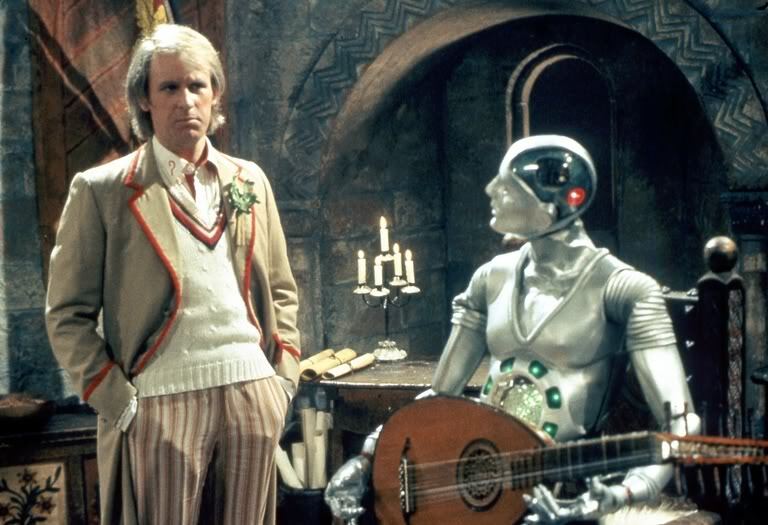 This month we're talking about Celtic myth, 17th-century antiquarianism and the best Doctor Who companion who never was. 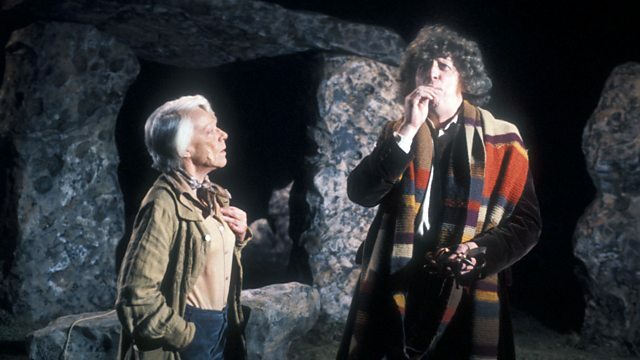 That's right, it's Tom Baker classic The Stones of Blood! This month, Doctor Who explores the secrets of time itself -- such as how you can cram four episodes' worth of fun into just six! Plus we talk about natural disasters in the Bronze Age, the birth of Zen Buddhism, and what Michaelmas even is. Stumbling, lumbering, strangling -- this one's got it all! We're back with a look at classic Patrick Troughton Doctor Who story The Tomb of the Cybermen. 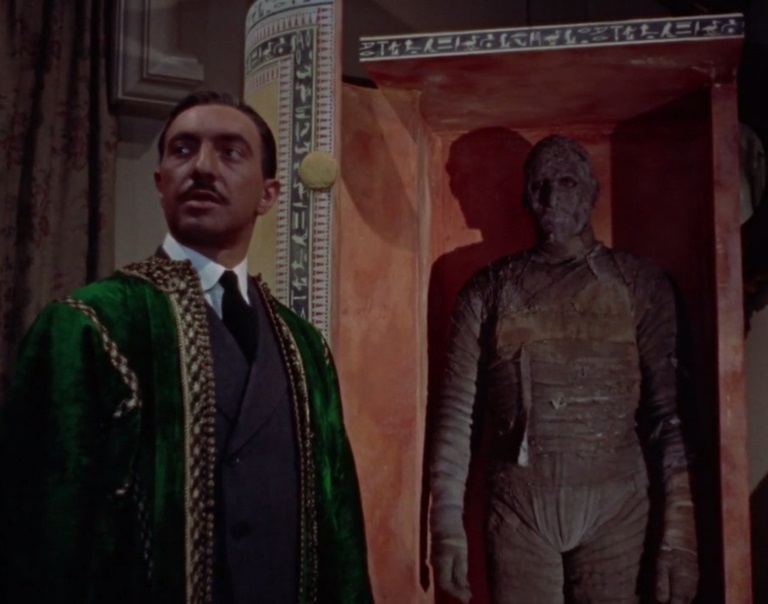 PLUS: we talk about the 1959 Hammer version of The Mummy. As always, click here to find images, videos and further reading on our blog. There's a lot this month, so you should definitely check it out. You can also like us on Facebook or follow us on Twitter! 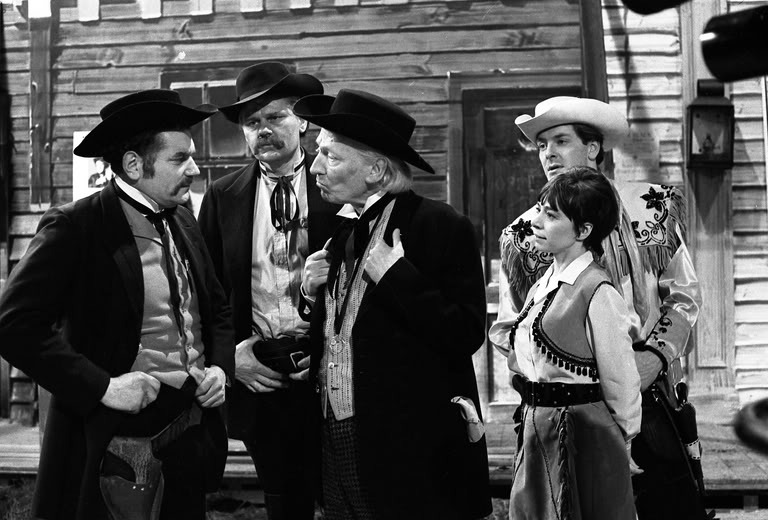 Badmen, bullets and ballads -- that's right, it's the classic William Hartnell Doctor Who story The Gunfighters! 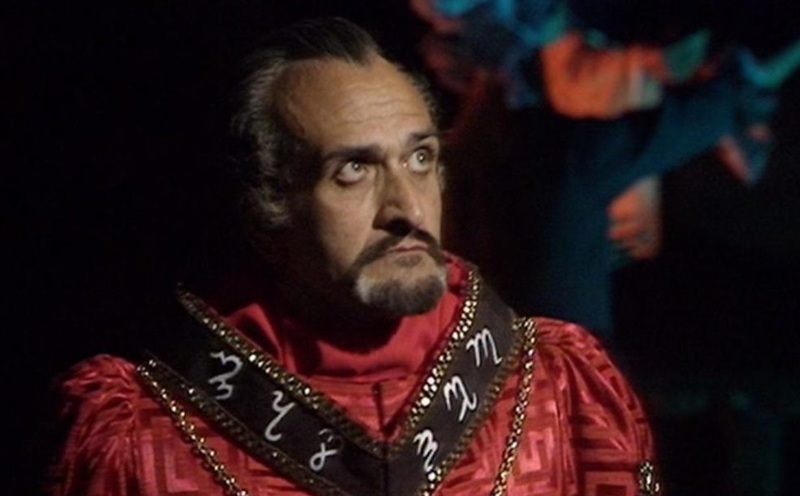 Spies, Vikings, ancient evils, glowy eyes, the Red Army, curses, vampires, poison gas -- all this and one of classic Doctor Who's finest emotional storylines. What else could it be but the critically-acclaimed Sylvester McCoy story, The Curse of Fenric? If you enjoyed the episode, why not check out our blog for more articles, like us on Facebook or follow us on Twitter? You should definitely check out the blog for this episode, which has a helpful visual guide to things we talk about during the episode. Industrial disputes, brain fluid, thinking trees and a baby T-Rex -- it must be classic Doctor Who story The Mark of the Rani! Read more about Blists Hill Victorian Town here! If you enjoyed the episode, why not check out our blog for more articles, like us on Facebook or follow us on Twitter? Disco space pirates in bubble helmets! Drug-addict corpse knights! The universe's most ancient radioactive dog hospital! It could only be the classic Doctor Who story Terminus! For a great post on the Wayne Barlowe influence on the Garm, check out Siskoid's blog. It doesn't mention the Dilbian, though, which is another good candidate. We've got an image up on the blog if you want to check that out. After a few weeks away, we're back with a look at the classic Doctor Who story Pyramids of Mars! Join us as we talk mummies, missiles, mythology and why you should just put the damn coordinates in the rocket yourself. 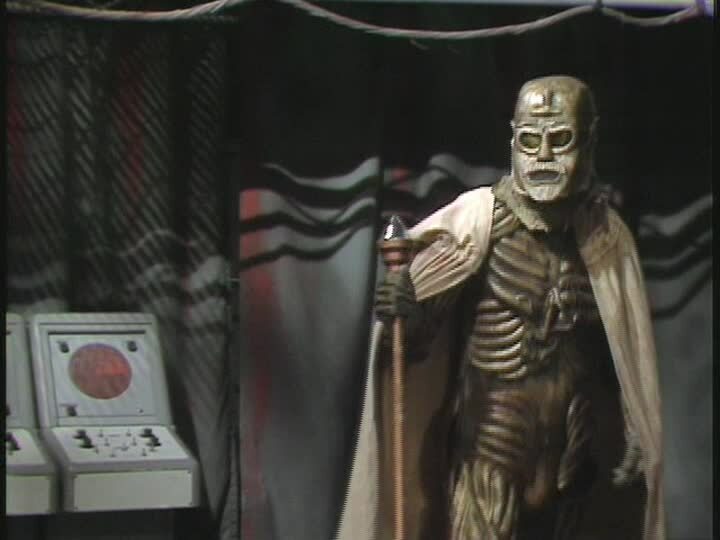 Plus: our special guest Luke Slater explains the mythology of Sutekh! Luke Slater is an old university friend of James's who steps in to cover the Egypt-shaped hole in James's historical and mythological knowledge. You can read his writing about television and film and stuff at My Life as a Doge, or dive into the world of B-movies at Bad Movie Marathon (although be warned, sometimes he also talks about good movies). Speaking of the Egypt-shaped hole in someone's knowledge, you can read James's reports of his trip to the Rosicrucian Museum (mentioned in this episode) here, and check out some summaries of the Monstrous Antiquities conference here! Enjoy! Finally, you may notice that James's audio sounds a little better now. Not good, you understand, but better. That's thanks to the help of good friend Jason Walter, who has brought our mic technology up from the stone age a bit. Demons, aliens, archaeology, evil Morris men, a white witch -- it's all excitement in classic Jon Pertwee story The Daemons! Normally our run through classic Doctor Who would lead us to a Pat Troughton story next, but there was a problem with the file. Fortunately, we record well in advance, so we have this one for you to enjoy instead. If you enjoyed the episode, why not check us out on Facebook or Twitter? Don't forget to check out our blog, where we're posting all sorts of other articles about classic Doctor Who. 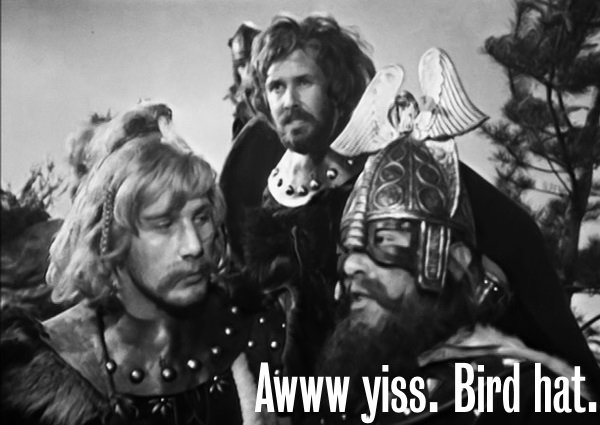 The first recurring villain in classic Doctor Who, a brilliant performance by Peter Butterworth, and Vikings, Vikings, Vikings! What else could it be but classic William Hartnell story The Time Meddler? Welcome back to Pledge Break, the show where two old friends talk about the Doctor Who version of history and the history of Doctor Who! There are lots of links to related things over on our blog, so check them out if you feel inclined! 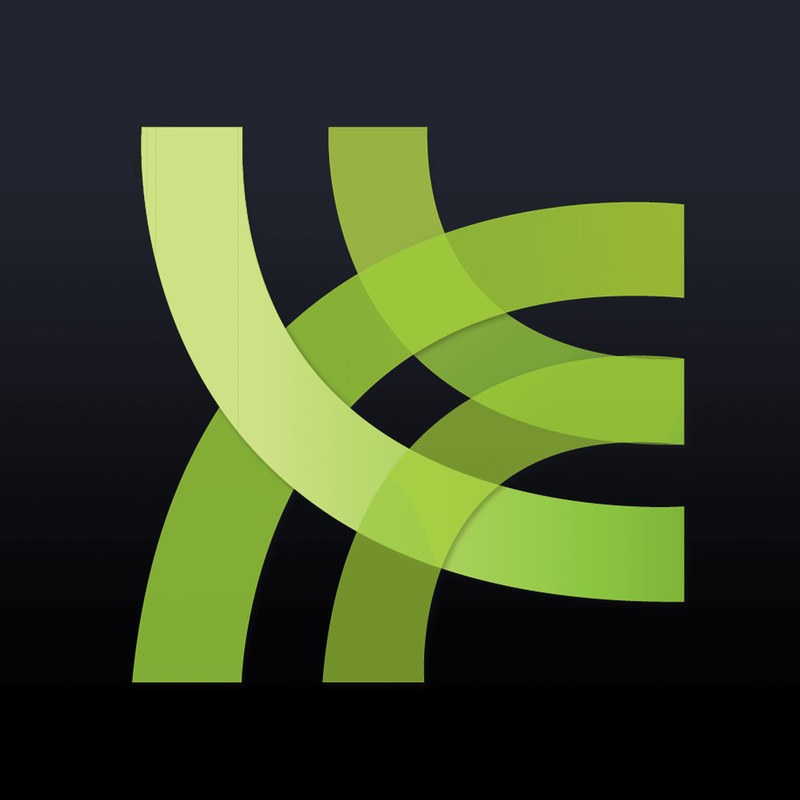 You can also follow us on Twitter or like us on Facebook! So, in Episode 6, Jesse mentioned some interviews that included some interesting material about the story. 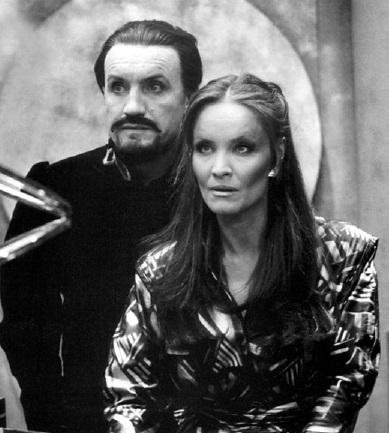 They're in this episode of Radio Free Skaro, which you should definitely check out. Of course, you should check out RFS in general! Swords, knights in armour, pitched battles, futuristic technology and ancient demons -- classic Seventh Doctor story Battlefield has it all! 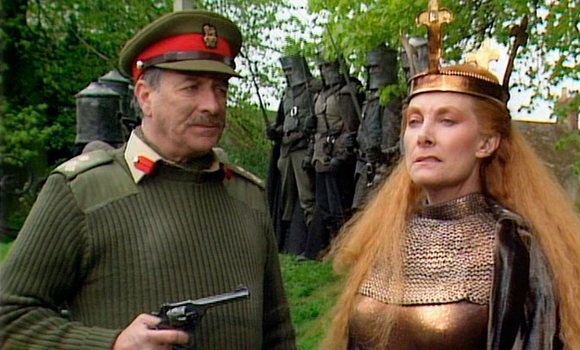 In addition to all the Arthurian goodness, Battlefield is full to bursting of high-quality fanservice, including the last appearance of the Brigadier, cryptic hints about the Doctor's identity, a cameo by Bessie and the return of a classic co-star. So full, in fact, that it's our longest episode yet! If you enjoyed the episode, why not check out our blog, follow us on Twitter or like our page on Facebook? In this episode, the Doctor and Peri find themselves on a ... well ... a mysterious planet. 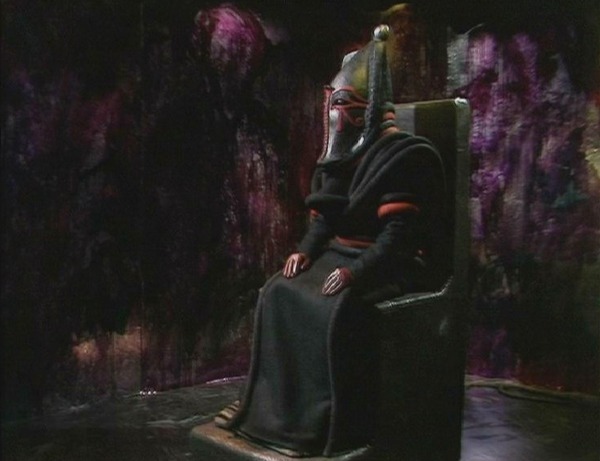 And we get into some meta-discussion about the Trial of a Time Lord and the fate of the series. Come for the robot, stay for the tangents. During this episode, we talk about a couple of things you might want to check out, including FDR: American Badass!, in which Jesse plays Werewolf Hitler, and Butser Ancient Farm, where archaeologists try to understand life in the pre-Roman era and also apparently there's some kind of an alien device. In this episode, we've got the deep roots of the English constitution and also a shapechanging robot, plus a cute little castle. That's right, it's often-overlooked Fifth Doctor adventure The King's Demons! It's not exactly a classic, but it does express a lot of what we like about Doctor Who! As always, you can read our blog, follow us on Twitter or like us on Facebook. If you want to read more about the British Museum's Magna Carta exhibit, check out this blog post. 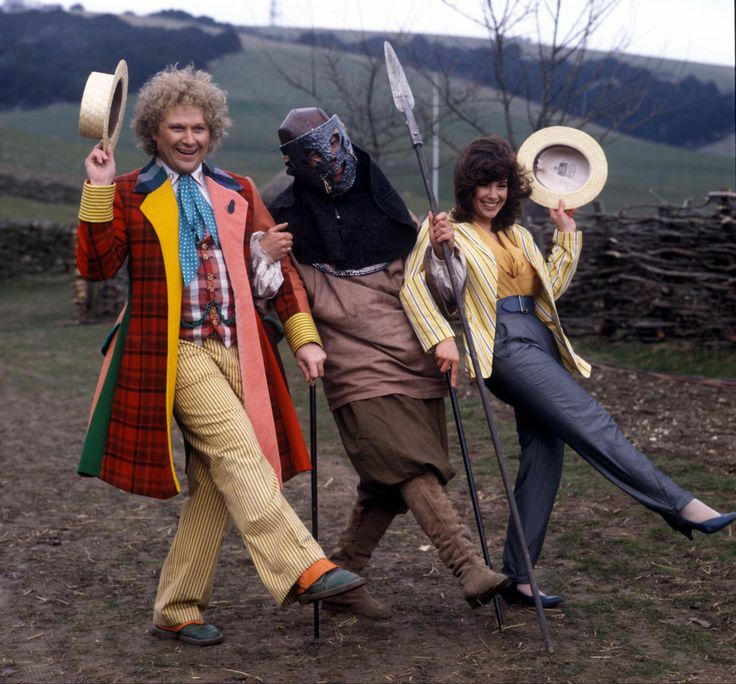 We're getting post-medieval this episode as we check out confusing but entertaining Tom Baker story The Masque of Mandragora. As always, if you enjoyed this episode, why not like our Facebook page, read our blog or follow us on Twitter? We're back into historical -- or at least pseudo-historical -- Doctor Who episodes with the 1973-74 Jon Pertwee classic, The Time Warrior! The dirty, violent middle ages portrayed here are a world away from the dignified nobility we saw in The Crusade. If you like the episode, don't forget to read our blog or like our page on Facebook! As always, you can also follow us on Twitter. In our second episode we're talking about the recently-rediscovered Patrick Troughton story The Enemy of the World! Not much history on this one, but plenty of action, elaborate schemes, amazing costumes and off-the-wall accents! If you enjoy the episode, why not follow us on Twitter or like us on Facebook? Welcome to Pledge Break, in which two old friends talk about the Doctor Who version of history and the history of Doctor Who! In our first episode we're talking about the classic First Doctor adventure The Crusade -- and about the actual Crusades as well! If you want to read more about our show, check out our blog.